Information submitted in a nomination letter to the U.S. National Ski Hall of Fame by Bill Berry, USSA Historian Emeritus. Otto Lang came to the United States in 1935 as the first official emissary of the Arlberg Ski School in Austria. Having been a top assistant to Hannes Schneider at St. Anton, it did not take long for Otto’s fame as an instructor, photographer and author to spread throughout North America. Born January 21, 1908 in Bosnia (where his father temporarily served with the Austrian military), Otto’s skisport career began as a junior Nordic competitor and ended as a senior alpine racer for the prestigious Arlberg Ski Club. He competed in numerous important ski jumping contests and later in such major alpine events as the famous Arlberg Kandahar. While never a competitor in America, he was closely linked to many major events in an organized capacity. Otto considered that being mustered into Schneider Ski School back in 1930 was his “luckiest break”. It was there he developed his elegant style that became his hallmark and there in 1935, he was “discovered” by Katharine Peckett, an American socialite ski entrepreneur, then on an inspection tour of European winter sports resorts. She persuaded Otto to come to America at a time when the only other disciples of the Arlberg technique were Sig Buchmayr at Peckett’s-on-Sugar Hill and Hannes Schroll in Yosemite National Park. Otto had Hannes Schneider’s blessing. This carried with it permission to organize official Hannes Schneider Ski Schools. Following a winter at Peckett’s, Otto joined Jerome Hill, the railroad family scion and ski enthusiast, for a trip to the Pacific Northwest to ski at Mt. Rainier and Mt. Baker and incidentally, to shoot a film on skiing. The picture was called “Ski Flight” and opened at Radio City Music Hall in New York City, a complimentary feature at Walt Disney’s “Snow White and the Seven Dwarfs”. The run lasted a record six weeks and won an exhibitor’s prize as “The Best Short Subject of the Year” for Warner Brothers. For the winter of 1937, Otto opened his first Hannes Schneider Ski School at Mt. Rainier, followed successively by schools at Mt. Baker and Mt. Hood. During this period, he often was invited to Sun Valley where the slopes of Dollar Mt. regularly attracted Nelson Rockefeller. Nelson, who had been taught the Arlberg technique by Otto at Peckett’s, would arrive by private car and accompanied by friends. Simultaneously, Otto would come over from Mt. Rainier to be Nelsen’s private guest instructor. The arrangement so intrigued founder, Averill Harriman, that in 1939, Otto was persuaded to join the Sun Valley Ski School with Director, Friedl Pfeifer. When World War II broke out, Pfeifer and many of the Austrian instructors were temporarily interned. However, Otto had already become an American citizen and was married to an American girl. He took over as ski school director and finished the 1941-42 season. The next winter, Sun Valley ceased operation as it was taken over by the navy as a rest center. Although classified 1-A, Otto, due to an influx of family, never was inducted into the Armed Services. Along the way, his skillful direction of skiing sequences in Sonja Heinie’s “Sun Valley Serenade” had captured the attention of producer, Daryl Zanuck. The latter was then in charge of production for the Army Signal Corps and soon, Otto found himself commissioned to make a number of training films, among them: “The Basic Principles of Skiing” for the newly-formed mountain troops. The filming was at Sun Valley and strictly improvised. Otto made a film which lured recruits to want to ski and there are 10th Mountain veterans who recall that it did just that. The film industry has recognized Otto’s talent. He has received four Academy Awards nominations for theatrical motion picture films (26th Century Fox Film Corporation). At war’s end, Otto took over the ski school again. Many of his former instructors who had served so well in the 10th Mountain Division returned to their ski teaching. Sigi Engel became Otto’s right hand man. In 1948, Otto brought France’s Emile Allais to Sun Valley. This was considered a daring innovation – the French technique in contrast with the Austrian Arlberg. Skiing, particularly racing, profited. Emile taught his way to the top skiers and racers while Otto and his staff went about things the Arlberg way. Otto wrote the following books on skiing technique: Downhill Skiing, How to Ski, A Bird of Passage-The Story of My Life and Around the World in 90 Years; Images from My Life’s Journey. Throughout his film career, Otto continued his interest in the ski sport and its promotion, giving freely of his talents as author, speaker, director and photographer. During the 1972 Winter Games at Sapporo, Japan, he served for the Copley newspaper’s, even running the downhill course personally for a real first-hand report. 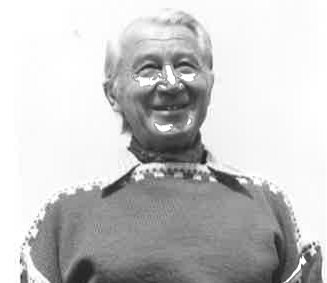 Otto Lang was elected to the U.S. National Ski Hall of Fame in 1978. If you notice any errors or inconsistencies in Otto Lang's bio, click here to let us know.